Travel is more accessible and affordable than ever before, encouraging more and more people to pack their bags and set off on a voyage to broaden their minds and provide magical memories that will never be forgotten. There are many reasons people choose to travel, but the two primary factors are relaxation and exploration. We travel because we want to get away from our mundane, regular lives and environments, seeing new places, indulging our senses, and feeling totally at peace. A cruise provides all of those things and more, and this is why cruise vacations are becoming increasingly popular; they allow people to enjoy long periods of total relaxation, with all food and services provided on board, while also charting a path of discover at various islands and ports. If you’re looking for the best cruise for you, it makes sense to make use of price comparison websites like Kayak. Founded back in 2004, Kayak is currently one of the biggest and most popular fare aggregators in the world and is used all over the globe to help travelers find the best deals and most exciting trips. Booking a cruise with Kayak is quick and easy; you won’t need to use any other websites or price comparison tools when you take a look at Kayak, with this site offering one of the most extensive selection of cruise destinations and routes you could ever hope to find. If there’s a cruise you want to take, Kayak will be able to help you find and reserve it. Booking a cruise with Kayak couldn't be simpler, and the site goes to great lengths to make the process as easy as possible for every traveler, as well as offering post-booking help in case any changes or cancelations need to be made. As a search engine, Kayak doesn't have refund policies, as every booking is made through an individual provider, but the site's smart features and solid customer service make it very easy to find the right cruise and ensure that every step of your journey goes as smoothly and seamlessly as possible. The whole point of using a vacation search engine like Kayak is to find the best deals and prices, so it's important to see that Kayak offers one of the biggest ranges of cruise options you could ever hope to find. Not only that, but this search engine is always being kept up to date with the latest cruise deals, special offers, discounts, and price cuts. If you're looking for cheap cruises or just want to have the peace of mind that comes from knowing you didn't pay over the odds, Kayak is the best place to search. Kayak excels in terms of options, offering more variety and choices than any other cruise search engine. In terms of departure ports, for example, you'll be able to choose from dozens of different cities all around North America and beyond. 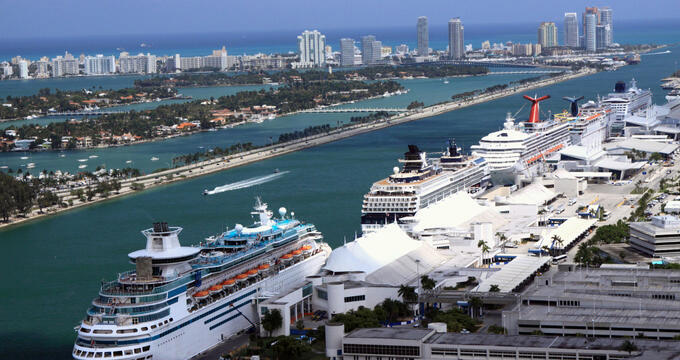 Some examples include American cities like Miami, Fort Lauderdale, Long Beach, New York, New Orleans, Jacksonville, Seattle, and Honolulu, as well as more exotic destinations like Nassau and Cozumel or European major cities like Amsterdam, Barcelona, Venice, Paris, Marseille, and Genoa. For cruise destinations, Kayak again offers a long list of options. With this search engine site, you can book cruises to the Caribbean, Mexico, Cuba, Alaska, Europe, Hawaii, Bermuda, South America, the islands of the South Pacific, and more. River cruises are also available at Kayak, as well as special cruises and transatlantic cruises. All you need to do is use the simple search engine features to choose the cruise destination you want and Kayak's technology will take care of the rest, finding the best deals and options for you and your fellow travelers.